Ode to My Mom, the Queen of Earth Day! My mom with her recycling ‘box’ (they don’t have bins to use). And her beautiful, steaming compost pile! I always say my mom was earth conscious before it was cool. She has recycled, conserved and reused before these were even buzzwords that all of the cool people talk about now. Maybe it’s because she grew up on a farm, or maybe it’s because she was a bit of a hippie in the 60s. I just thought she was frugal and crafty, and sometimes…a little crazy. She might have been the very first recycler in the town where I grew up. She recycled before there was even a recycling program. She would collect cans, plastic bottles, glass bottles, stryofoam and paper, and save them in our house. About once a month she would load up the back of the car and drive 20 to 30 miles away where there was a recycling plant. She would even collect other people’s cans and bottles and things, because it bothered her that they would get thrown into the garbage otherwise. There is some sort of a recycle program there now, but it’s not curbside, it’s not convenient, yet she does it anyway. She gets irritated that they won’t take all of the different numbers, so I think she still makes that monthly trip for the things they won’t accept in town. At the end of her garden you will find a giant steaming pile of rubbish. I swear, this woman just hates to throw things away! 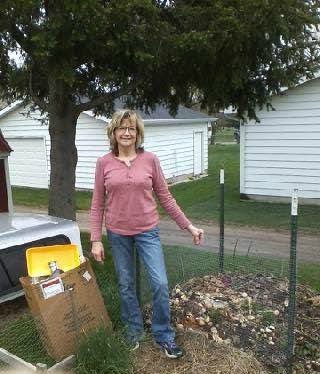 My parents are master composters! I always thought it was weird that we took our food scraps out to the garden, but her garden is always beautiful. And those bits of apple peels, lettuce scraps and eggshells had something to do with that! Now I get it! If she can’t recycle it, or compost it, she will figure out a way to reuse it. For example – and she will hate that I am telling this story again – but it has to be told. All through grade school she never once bought a bag of brown paper lunch bags. I had to use leftover bags from the grocery store, or the hardware store, or wherever else you might have gotten a bag. Sometimes they were medium-sized and other times they were the big, full-sized grocery bags. And if I didn’t bring them home to reuse for the rest of the week, she would get upset with me, and have to go find another bag in her collection. By the end of the week my lunch bag was looking pretty shabby. When I discovered that you could buy a big bag of normal-sized, brown paper lunch bags for like a dollar, I was miffed! Here I thought they must be very expensive because why else wouldn’t I get a new bag every day like everyone else at school. But now I get it, she was ahead of her time. At the time I didn’t appreciate it, but my mom was very thoughtful. Not only was she thoughtful about the environment, she always made sure I was taken care of and well-fed. I never had prepackaged chips or HoHo cupcakes in my lunches, but I did have homemade snacks and healthy treats that she made and packaged herself. I want to be like her when I grow up! This will have to do for now, until I can make the real thing! I guess I just got used to some of the rather odd things that she did. When I was dating my future husband in high school, he finally asked me one day why my mom kept old empty bread bags in the freezer. I guess I never thought about it. She had just always done that. She would use empty bread bags instead of Ziploc bags. And her mom had taught her to keep them in the freezer so that any little bread particles didn’t get moldy and gross. Smart! And this might be the funniest story of all. She believed she had found a use for dryer lint. She started saving different colors, and was going to make some sort of picture or collage out of it. Luckily, we talked her out of that project. Because… YUCK! She had taken it too far this time. There should be some sort of award for people like her. She just did these things because it was the right thing to do. Why would you throw something away that could be reused or somehow turned into more of the same thing, or something entirely different? It wasn’t always convenient but she did it anyway. Call it frugal, call it environmentally conscious, call it whatever you want. 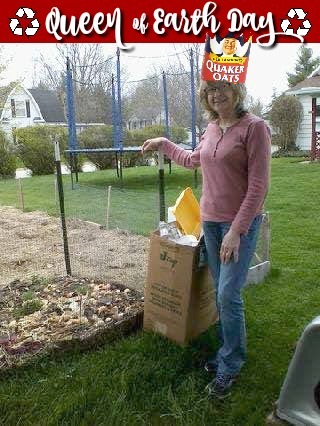 But my mom is the queen of Earth Day and I’m going to make her a crown out of an empty oatmeal container!